2) tons of yummy food (it is SO not an exaggeration when I tell you that I definitely eat the most on this day than any other - and love every bite!) and last but not least, Thanksgiving brings my favorite shopping day of the year! That's right - it's tradition! My sisters and I get up waaaay before the sun on the Friday after Thanksgiving, pile into my Mom's mini van and brave the freezing cold and crazy people to get ourselves some deals. And some Starbucks. And some Egg McMuffins... cuz those are all part of the tradition too! The band just released their second music video and I wanted to share it! :D I think it's incredible. For real. (The superhot chic in it is Doug's wife, Carmen - which makes me love it even more.) Enjoy! Hope everyone had a wonderful Easter! Like any other holiday, it's such a great time to be with family and friends. And yet, unlike any other holiday, Easter is so full of rememberance for me. A Savior who was without sin, took on my sin and died for me... so that I could have abundant life. The picture of that is so expansive and yet so intimate, all at the same time. Where would I be without my Jesus... He's my everything. So for the holiday, we drove to Kansas to be with John's family. On the drive there, we had rain and then snow for hours... oh so fun. Driving home, we had rain and then snow once we got home. Lovely! However, the weather while we were actually there was beautiful - so that's a plus! We had a such great time with everyone. 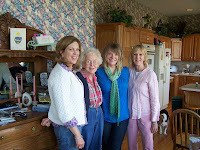 The guys did plenty of golfing, which left us girls time for shopping, baking together and just plain catching up. Paul and Emily with Mommy and Daddy - all ready for church. And Paul with his easter basket - look at that face!! 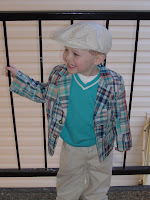 Padrick in his adorable easter outfit complete with newsie hat. Then he's off to hunt for eggs! We finally have a girl!! My sister Cindi had her baby girl, Emily Grace Pedersen on Wednesday night, February 11th. There were no complications, and Emily and Mommy are both doing great. And because I know Cindi won't brag on herself - I'll do it for her. That woman had no epidural! She didn't with Paul either (her first baby, who's now a VERY grown up - and hysterical - 2 years old). Cindi definitely got her pain tolerance from my dad. No offense Mom, but you know I'm right there with ya. Ugh, I can't wait to get home and hold this sweet little thing. I'll have more pics soon!! My parents came out to Colorado a last week to visit. We had such a blast with them! They came from below zero temperatures and a foot of snow in Indiana... to sunny, 60 degree-weather here in the Springs! It was a great week for them to be here. John and I had to work most of the week, but they didn't mind at all. They went out exploring the city or just relaxed around the house... then we did stuff together in the evenings and over the weekend. Saturday we took them to a nearby town for the most amazing breakfast spot. It's a tiny little restaurant called The Pantry - and the food is incredible. With Mom and Dad at The Pantry - before it got warm for the day! Then we took them to Manitou Springs to walk around and look at some shops. I bought this great turquoise cowboy hat!! Just kidding. John wouldn't let me buy it. Meanie.